Meeting and showing off my Charley Harper animations with Brett Harper, Charley's son. 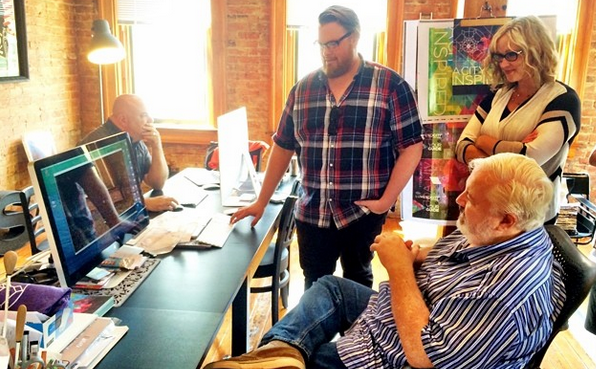 Getting invited to design and animate on the Lumenocity team was a real adventure from the get-go. Dan and Steve of the Brave Berlin agency had invited me to work on various aspects, collaborating on the closing Tschaikowsky piece and then owning the Polovestsian Dance piece, a 12 minute animated journey through Charley Harper's work. It was a ton of work, and took a huge chunk of the summer that allowed me to work with the Charley Harper estate to pull from his work and bring it to motion through the Cincinnati Symphony and collaborate with other amazing designers and animators. A gift to Cincinnati, and in its second year, Lumenocity 2014 was spectacular. With over 50,000+ people attending 3 nights, and getting to see Charley Harper's work come to motion made me feel a real sense of accomplishment, something that I will remember my whole life, thanks team! Last night before Lumenocity, hitting the render button after an all-nighter. 50,000+ people seeing Charley Harper's work animated for the first time, a truly amazing moment in my life. Thanks to Dan and Steve at Brave Berlin, Brett Harper and the Charley Harper estate and everyone involved, Haile Foundation, CSO and Cincinnati. The Cincinnati Symphony Orchestra and the Cincinnati Pops Orchestra are proud to present LUMENOCITY 2014! The performances will begin at 8:30 p.m. each night with John Morris Russell conducting the Pops. After intermission, Music Director Louis Langrée will lead the CSO for an amazing display of sound and light. The program for the second half of the performance starts with the iconic "Fanfare for the Common Man" by Copland. The program also features "Short Ride in a Fast Machine" by John Adams, Tchaikovsky's "Fifth Symphony," "Nimrod" from Elgar's "Enigma Variations," and Borodin's "Polovstian Dances" from "Prince Igor." Before the performance begins, organizers have planned LUMENOCITY Village which will feature pre-concert performances in Washington Park's bandstand, arts and crafts, and a greatly expanded food and beverage service. The village opens at 4 p.m. on Friday, August 1, and will open at 11 a.m. on both Saturday and Sunday, August 2 and 3. This radio broadcast will be on Cincinnati's classical public radio station, 90.9 WGUC. The broadcast will feature the complete LUMENOCITY performance, including the first half featuring the Cincinnati Pops and guest performers, and the second half with the Cincinnati Symphony. This special radio broadcast will allow those who live with a view of Music Hall to both see and hear LUMENOCITY from a distance. CET, Cincinnati's public television station will air the second half of LUMENOCITY live starting at 9:30 p.m. This portion features the CSO led by Louis Langrée performing five selections set to stunning visuals developed by the artists of Brave Berlin. This live broadcast will be available to nearly 900,000 television households throughout the region. For the final performance, the public is invited to experience together a live simulcast at these locations. Audiences are welcome to bring picnics and lawn chairs to either location and experience LUMENOCITY free of charge with friends and neighbors. Concessions will also be available at Riverbend. Thanks to CET and 90.9 WGUC, LUMENOCITY will be carried via live web stream to people around the world for all three performances at lumenocity2014.com. The live stream will begin at 8:30 p.m. EST on all three days August 1, 2, and 3. Front Page of the Cincinnati Enquirer - "So Strong, He Lifted the Reds, All of them"